BOSTON, Dec. 2, 2014 – Foreclosure starts in the Bay State continued to climb in October, posting a 91.5 percent increase year-over-year, according to The Warren Group, publisher of Banker & Tradesman. 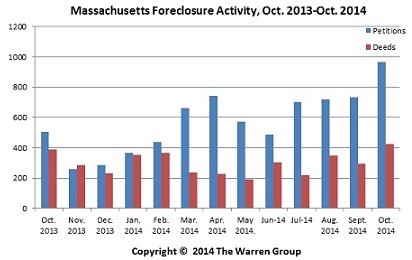 Lenders filed a total of 965 foreclosure petitions in October, compared with 504 during the same month a year ago. This marked the eighth consecutive month of year-over-year increases and is the highest number of starts since November 2012. A total of 6,384 foreclosure starts have been filed so far this year, a 36.5 percent increase compared with 4,678 petitions recorded during the same period last year. Petitions mark the first step in the foreclosure process. Foreclosure deeds posted a 9.3 percent increase in October with 423 completed foreclosures recorded compared with 387 a year ago. This marked the third consecutive increase in deeds year-over-year and puts the number of foreclosure deeds at a level not seen since September 2012. Year-to-date, a total of 2,961 foreclosure deeds were recorded so far this year, down 6.7 percent from the 3,173 deeds recorded during the same period last year. The number of auction announcements tracked by The Warren Group also decreased slightly in October. Auction announcements declined 1.3 percent to 623 from 631 in October 2013. From January through October, 4,429 auctions were announced, a 14.5 percent decline from the 5,179 auctions recorded during the same period in 2013. The Warren Group offers a range of real estate products, information services and printed publications, including the weekly newspapers Banker & Tradesman and The Commercial Record. The company also presents and organizes trade shows and events for a variety of industries, including bankers, mortgage brokers, credit unions and lawyers. Based in Boston, the company was established in 1872 and is now in its fourth generation of family ownership and management. For more information about The Warren Group, visit www.thewarrengroup.com.